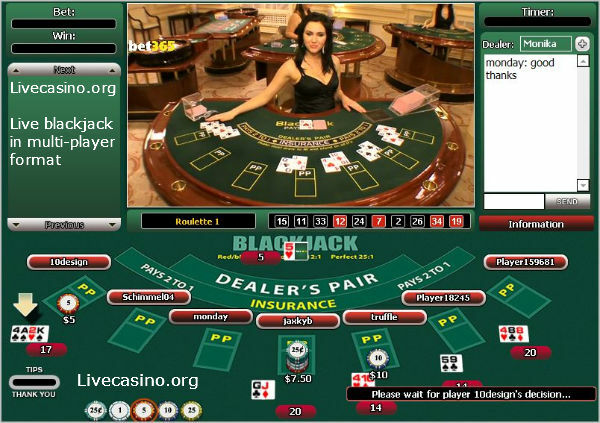 Multi-player live blackjack follows the play format that you're probably familiar with from visits to non-online casinos - ie a 7 seat table with a space for 7 players (plus those 'betting behind'), each of whom plays their hand in turn. This is probably the most common form of live blackjack, and our favorite...simply because it's how the game should be played. 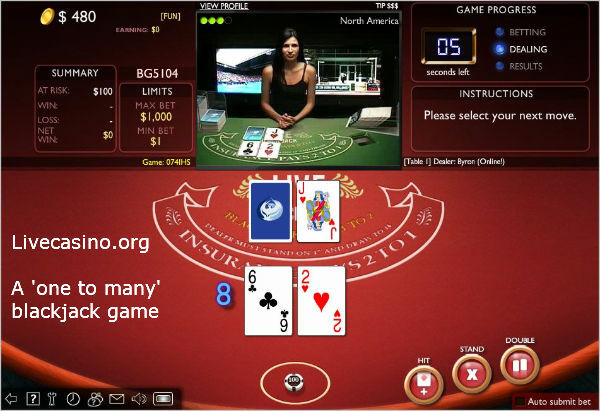 With these games a maximum of 7 players can take a seat and play on any given live-streamed table - consistent with the conventional game. 'One to many' live blackjack takes a different approach to the deal. Instead of a hand dealt to each player in turn, a single 'player' hand is dealt. But many players may be playing this hand dealt by a single dealer... hundreds, maybe even thousands in the case of TV broadcast games like at Smart Live Casino (hence the term one-to-many). The deal is altered to allow for players' different play decisions (hit/stand/double etc) to the effect that the single deal caters to all players. Not conventional, but importantly each player still plays their own hand and wins or loses accordingly. From an operator perspective 'one to many' blackjack games are attractive because they don't more dealers and tables to service more players...one is enough. Because of this, many of these games are also offered in free play mode because there is no marginal cost of dealing to additional players. Live online casinos have real dealers dealing real playing cards. It follows from this that advantage players can easily count live blackjack games right? Wrong! Unfortunately the casinos, or rather the game developers who supply them with games, are wise to the possibility of counting and employ a very simple counter measure. All advantage players are aware that regardless of your counting method, (Hi-Lo etc) in order for the count to be effective, you need to be able to count and play well into the shoe. To ensure this can't be done, live blackjack re-shuffles will usually occur around half way through the shoe's deal - not allowing for sufficient count penetration. The common policy (indicated above) is cut card insertion approximately 4 decks into an 8 deck shoe. There are exceptions to this. You'll note that 5Dimes stated insertion policy is 75% into the shoe, although from observation testing we believe in practice the cut card is usually placed around 60% into the shoe. Didn't find what you were looking for here?